Title: Steel Panthers World at War. Individual Contributors: Gary Grigsby, Keith Brors, David Heath, Michael Wood, Nick Papp, Wild Bill Wilder, Scott Grasse, Mike Amos, Jim Faletti, Tom Proudfoot. Description: An update to the classic Steel Panthers game from SSI. 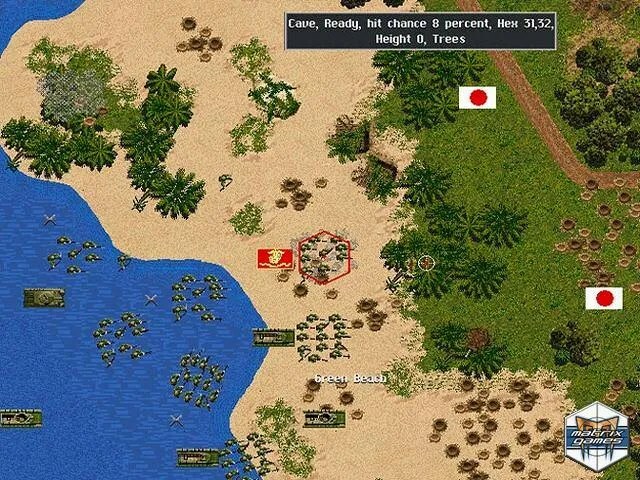 Turn-based, tactical wargame simulating World War II. Single and multiplayer (up to 4). Simulates combat from 1930 to 1949. Chateau de Quesnoy (Author: Paul Saunders) – June 6, 1940 – Along the Somme in France the Germans experience unexpected and sustained resistance from the 4th North African Division. The Vanishing Division (Author: John Redleg Rank) – November 23-24, 1942 – Play as Soviet troops attacking General Seydlitz-Kurbach’s German 94th Division (part of the 6th Army) at Stalingrad. Across the Wire (Author: Wild Bill Wilder, Jim ‘Figmo’ Faletti) – June 16, 1940 – An encounter between British and Italian troops in Libya. The Beginning of the End (Author: Davor Popovic) – June 7, 1942 – Soviet positions around Sevastopol begin to collapse as the Germans advance. Simulates the British Rat Patrol units in Libya, Egypt, Tunisia, Algeria, and Morocco in World War II. Simulates operations of the 7th SS Gebirgs Division ‘Prinz Eugen’ in 1945 against Yugaslavian revolutionaries. Next story Panther Games and Lock N Load’s Command Ops 2.